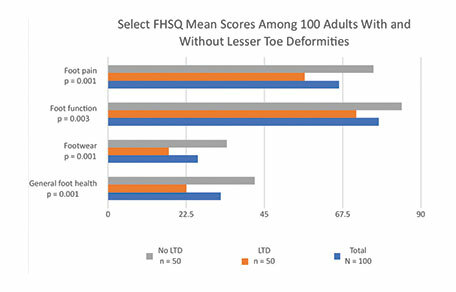 Scores for FHSQ range from 0 to 100, where 0 represents worst possible state of foot health, and 100 represents best possible state of foot health. The first study included 100 older adults with a mean age of 74 years; 50 subjects had LTD and 50 were without foot problems. Ages ranged from 65 to 88 years and sociodemographic characteristics were comparable between the 2 groups. Participants first had each foot measured and examined by a qualified practitioner. Participants then completed the Foot Health Status Questionnaire (FHSQ), in which they self-reported foot health-related quality-of-life by answering questions about foot pain, foot function, footwear, and general foot health. Physical characteristics (eg, LTD including hammer toes, claw toes, and mallet toes) were used to assess pain and function; footwear evaluation was related to availability of shoes and comfort, and general foot health perception was based on patients’ own assessments. Responses are detailed in the figure. The authors attribute the significantly lower scores for those with LTD specifically to the deformities due to their influence on plantar pressure and postural disturbances, as well as their association with falls in the geriatric population. They note that helping patients maintain independence by maintaining functional capacity is critical for the overall health of the elderly. Given that 1 in 4 older adults is at risk of falls, and that more than 75% of those with foot problems are at increased risk, assessing foot health, in particular LTD, in this population at every visit can play a vital role in preserving patients’ quality of life. In the second study, researchers wanted to examine foot health in a community-dwelling population with Alzheimer’s disease (AD), with specific attention to footwear. A progressive degenerative disorder, AD is associated with declines in memory and executive function which can affect communication skills; mobility challenges, including disturbances in equilibrium and limb coordination; sleep disturbances; frailty; and falls. There is currently no cure for AD, which affects mostly those over age 65. The public health challenge comes in the increasing frequency of this disorder in a population that is rapidly expanding and will continue to do so until 2050 given current projections. Working with a Center of Excellence AD facility, 73 patients with diagnosed mild to moderate AD were recruited for the study; ages ranged from 65 to 95 years (guardian’s consent was required for inclusion). Patients were evaluated using the Barthel Index for activities of daily living, and their feet were measured for length and width using a Brannock Device. Nearly 90% of patients reported foot problems of some type. The foot examination found bunions (79%), nail or keratotic disorders (52%), hallux limitus (47%), hallux rigidus (19%), and deformed toes (12%). Further measurement showed that nearly 70% of patients were using different shoe sizes between the 2 feet and/or inadequate footwear. 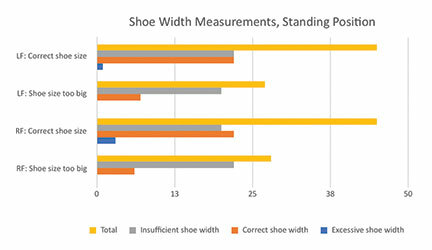 Key among their measured findings was that only 30% of patients in this study had shoes that were of accurate width. With nearly 70% of this group of AD patients using shoes that were not fitted properly, thus putting themselves at higher risk for falls, the researchers identified a clear need for podiatric clinicians to regularly monitor the fit of shoes in their patients with AD, with special attention to width. Lopez-Lopez D, Martinez-Vazquez M, Losa-Iglesias, ME, et al.. Foot health-related quality of life among elderly with and without lesser toe deformities: a case control study. Patient Prefer Adherence. 2018:12 251–255. López-López D, Grela-Fariña M, Losa-Iglesias ME, et al. Clinical aspects of foot health in individuals with Alzheimer’s disease. Int J Environ Res Public Health. 2018 Feb 7;15(2). pii: E286.